1. Follow instructions as given by attendants. 2. Avoid frequent or too lengthy exposure. Like exposure to the sun, use of a tanning device can cause eye and skin injury and allergic reactions. Repeated exposure can cause chronic sun damage which is characterized by wrinkling, dryness, fragility, bruising of the skin and skin cancer. 3. Wear protective eye wear FAILURE TO USE PROTECTIVE EYE WEAR MAY RESULT IN SEVERE BURNS OR LONG TERM INJURY TO THE EYES. 4. Ultraviolet radiation from tanning devices will aggravate the effects of the sun, so do not sunbathe during the 24 hours immediately preceding or immediately following the use of a tanning device. 5. Medications or cosmetics may increase your sensitivity to ultraviolet radiation. Consult a physician before using tanning devices if you are using medications, have a history of skin problems, or believe yourself especially sensitive to sunlight. Women who are pregnant or using birth control pills and who use a tanning device may develop discolored skin. 6. 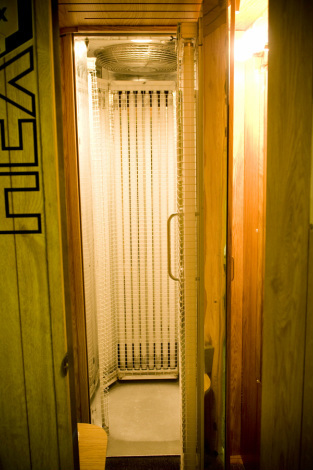 If your skin does not tan when exposed to the sun, it is unlikely that your skin will tan when exposed to this tanning device. 7. No customer under 16 years of age is permitted to use the tanning facility. 8. No customer is allowed to use a tanning device more than once every 24 hours.